My mother is a treasure collector. She’s had to give up many of her treasures as she’s gotten older and had to scale down, but there are still a few things from our collective history that adorn her home. Her old box purse from her dating days is one of them. It’s a beautiful little purse to be sure. I’m sure she was quite proud of that tucked under her arm at the dances in the 50’s. I’m assuming it was tucked under her arm…I’ve no idea what you did with a purse of that shape. Eventually of course, the box purse became dated. 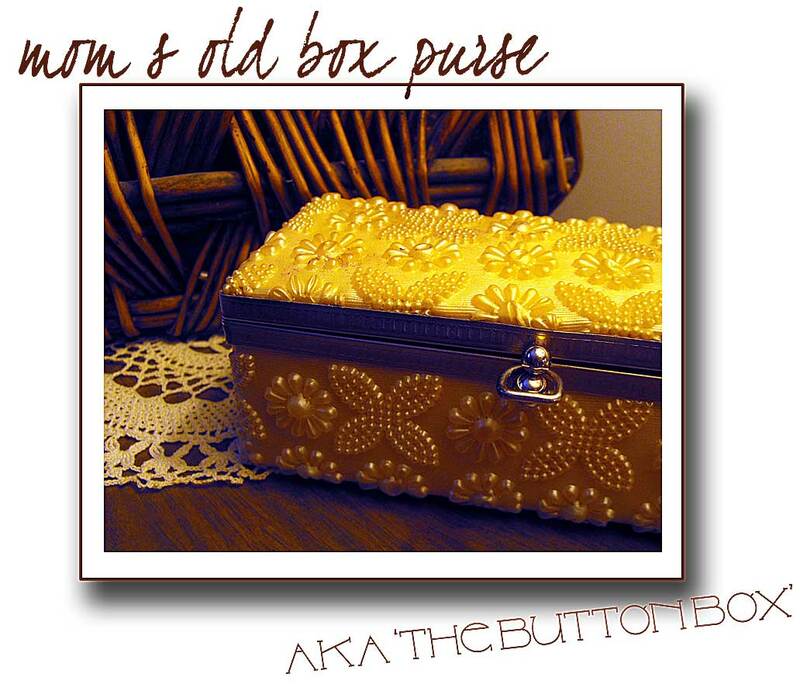 Ever resourceful, and not wanting something so beautiful to sit in the back of a closet, it became a button box for Mom in her Mother days. It has a creamy, satin finish decorated with raised florals and a gold button that snaps shut. The material is a sort of vinyl that intrigued me to no end as a small child. It’s oddly comforting that she still has the box and in surprisingly good shape, with only a few of the flowers slightly deflated looking. I’m ashamed to say that some of those squashed down flowers were by my own curious albeit destructive hand while my mother was unaware. I’ve begun constructing my own buttons lately. Some created from scraps of copper and silver and some flameworked glass ones as well. All flame-worked buttons have been kiln annealed. There are a couple of buttons available in the Etsy shop with more to go up soon. If you’re interested, take a look here. >Hehehe… so YOU squished the flowers! It’s okay. I’m ashamed to admit that I completely flattened Snoopy’s nose when I was little by pulling out the tiny threads one by one. It was a mesmerizing process, much to Snoopy’s chagrin. >*grin*..all in the name of curiosity. >What a great treasure that purse is! Heehee, bet those flowers just begged your little kid fingers to squish them 🙂 It’s so cool to have these kinds of things around the house! You are currently reading >Buttons and Beads at fireandglass.